Quilt patterns from Pine Tree Lodge (located in Minnesota – have you ever noticed how many talented quilters and quilt designers come from Minnesota? – must be something in the air there!) are full of variety. 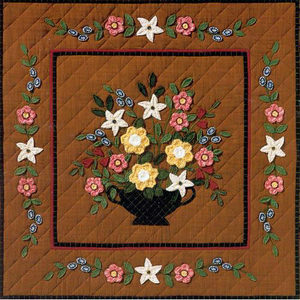 Simple pieced patterns, intricate pieced patterns, colorful, muted, applique, piecing mixed with applique, quilts, table toppers, samplers, totes and more! No matter your skill level, or the type of quilt you prefer, you’ll probably find several patterns that you like. 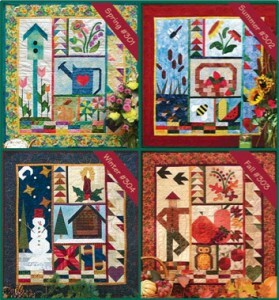 Homegrown Winter is a sampler with snow scenes, bells, a bright red cardinal, and several traditional blocks : friendship stars, log cabin, flying geese. Easy applique templates are included in the pattern. The wallhanging finishes at 34″ x 44″. Swap this out with the other Homegrown sampler patterns: Spring, Summer and Fall. A Parade of Seasons is another group of seasonal samplers. Both of these sets of samplers are great for cleaning up some of those fabric scraps that seem to keep multiplying. It’s called Heartstrings, but you can choose pine trees or stars if you prefer. Use flannel or chenille to add texture. This makes a great baby quilt. Grandkids, anyone?! 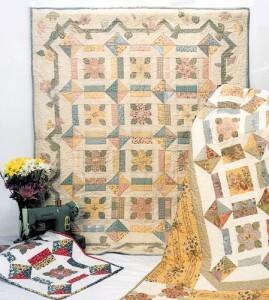 Daisy Dash uses a modified churn dash block to simulate daisies sprinkled across the quilt. 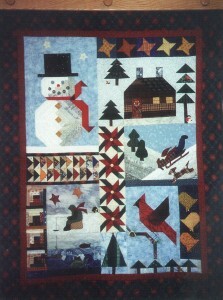 The pattern includes instructions for four sizes: bed quilt, lap quilt, wall hanging and table topper. Check out that unusual vine-y border on the lap quilt. Miss Mabel’s Garden (I have to say I just love this one!) is a collection of patterns with multiple techniques . . . piecing, applique, embroidery. 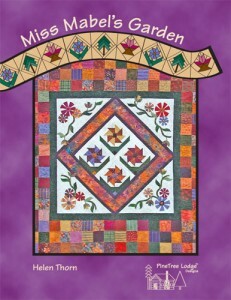 The book includes placemats, table runners, wall quilts and bed quilts. Fifteen projects in all for all skill levels. 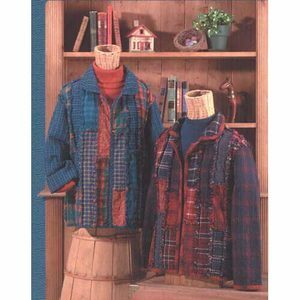 Be sure to visit the Pine Tree Lodge website where you will find extra downloadable projects to go with some of these patterns. It seems if we quilt, we can appreciate country style. 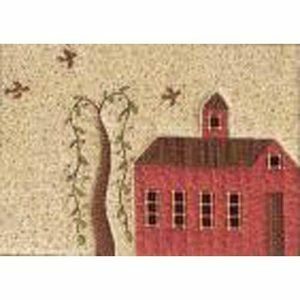 Janet Miller’s projects, whether they are crochet, stitchery, or quilts all have a country flavor to them. 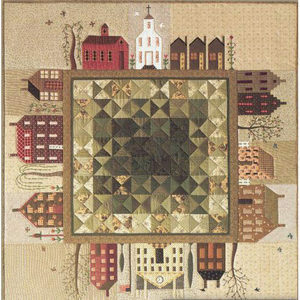 Many of The City Stitcher quilt patterns are samplers or incorporate folk art, or both. Olde Floral Bouquet is sitting is a plaid country vase. Layers of fabric and frayed edges give this wall hanging dimension. Silk ribbons are used for the stems, adding another texture. 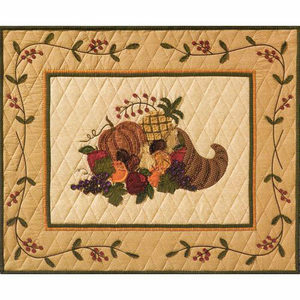 Thankful Harvest can be made with either the frayed edge technique, or with traditional applique. Silk ribbon is machined stiched to form the berry vines and fruit stems. Like cats? Know someone who does? Scrappy Cats has two options. One has strippy backgrounds and an inner border that sports buttons all around. The other option has solid backgrounds and no inner borders. The scrappy borders are foundation pieced. Quilted Village can be purchased as a complete set or, just like a village grows, one building at a time. If you buy them one a time be sure to start with the Schoolhouse as it includes the fabric requirements for the center village green square (which is a gorgeous quilt all on its own!) and for all the backgrounds. Circle Of Friends would make a great anniversary quilt. The star blocks offer room for signatures and the center displays a short poem. 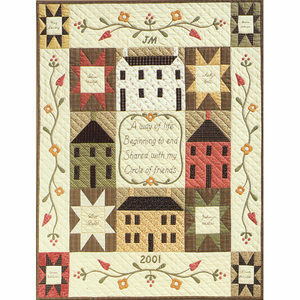 With a sampler look, this personalized quilt will be a treasure that is passed down through generations. Well, that was a sampling of the City Stichers quilts. We haven’t even touched on the stitchery patterns or the crochet patterns. Soon! Halloween has come and gone; we’re one stop closer to Christmas. Too far away still for many people to shop for gifts, but for those of us who enjoy making gifts, it’s closing in! Table runners and table toppers make great gifts. You can give beautiful, long lasting, personal gifts and they don’t take long to make. 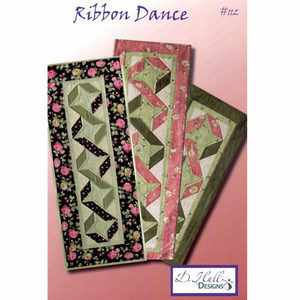 D Hall Designs has a large variety of “table dressing” patterns, including table runners, table toppers, and placemats. If you have more time, you can also choose one of Denise’s baby size, lap size, or full bed size quilts…. bonus! many of them include directions for a runner also. Triple Spin includes instructions for a 14″ x 35″ table runner and a 13.5″ x 13.5″ table topper that could also be used in a place setting. Using high contrast fabrics allows the spinning block to really stand out. Spinners kicks up the motion a little more. Again, high contrast fabrics would be best. Instructions are for placemats, and table runners in two sizes. 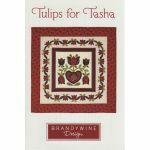 It might be fun to use a gold background for the table topper with red for the pinwheels and, with the same background in the placemats, use green for the placemats…. coordinating but not matchy-matchy. 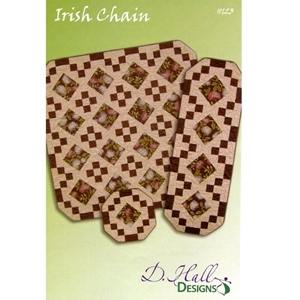 A table topper, a table runner, and a candle mat make up the Irish Chain pattern. How cute would these look with fussy cut Santas or Snowmen in the center squares?! 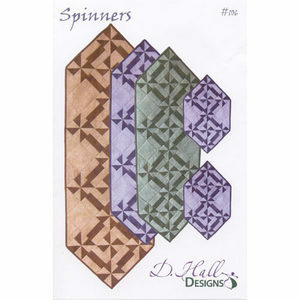 Browse the rest of D Hall Designs patterns. Discover Denise’s quick and easy piecing methods and try her “flip and sew” technique, all while making beautiful gifts. 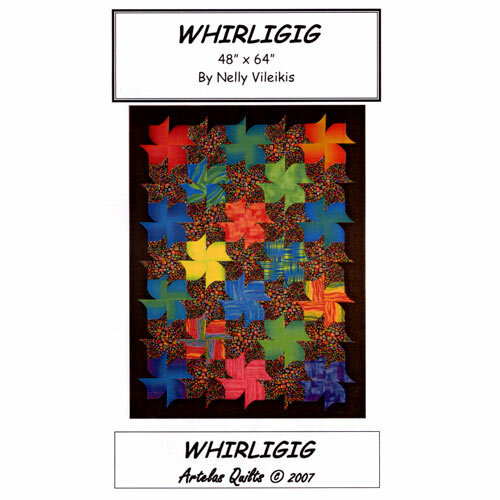 Nelly Vileikis has been driven to create quilts for quite a long time. She also enjoys sharing the craft through workshops, lectures, trunk shows and private classes. 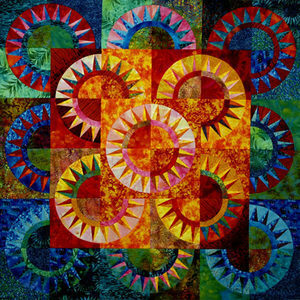 Her quilt designs are dynamic and colorful. 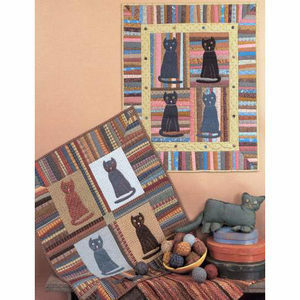 And they range from simple, easy quilts to more complicated showpieces. 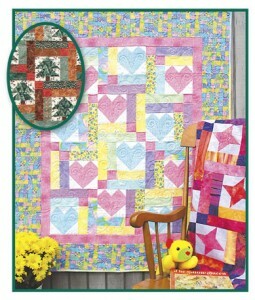 All Star Quilt allows you to choose a theme and then showcase it in the large center of the simple blocks. The instructions are easy to follow. Create a quilt that will mean something special. Amazon Reflections takes a new approach to the stack-n-whack method. Change your color palette and change the mood of the quilt, but you’ll still end up with a “wow” piece. Snowball blocks and modified nine patches come together easily (even for a beginner!) to create Playful Rings. No one has to know how easy it was to make this complicated looking quilt! Traditional patchwork and machine applique come together to create this contemporary design, Caribbean Fiesta. You’ll have to work a little harder for this one, but what a splash it makes, right?! In these colors it kind of makes me want to play Parchessi. Believe it or not, Whirligig is made up of only squares! Looks hard, but it really isn’t. Take the opportunity to play with color, fabric and composition. From simple to complicated, all of Nelly’s designs are colorful and interesting. Four Corners Designs – Popular Raggy Jacket Is Back! patterns for the quilting community since then. 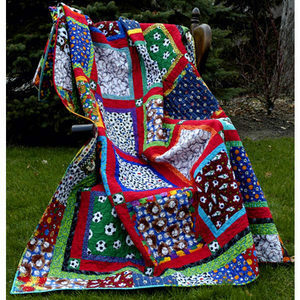 Their publications have become well-known for their innovative ideas, easy techniques, and clear instructions whether the projects are quilts, garments, or accessories. 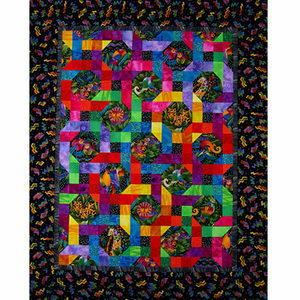 “QuiltersWarehouse.com is a recognized leader in the quilting industry. Their prompt delivery and exceptional customer service makes for a good fit with the us,” says Four Corners Designs. “Already on the presses and now ready for shipping is the very popular Raggy Jacket, which has not been available since November of 2010. It is the first in a series of Four Corners Designs’ retired patterns that are being considered for re-release,” says John Bruns, CEO of QuiltersWarehouse. Raggy Jacket is constructed with the “raggy piecing technique” so it’s fast and easy to put together. With only two layers of fabric it’s the perfect year round jacket…. cool summer nights, fall days, winter time inside when you just can’t warm up and early spring when a day in the 50′s seems almost like summer! It’s a cute, comfy jacket and the more you wear it and wash it, the more loved and comfy it will look. Since I can’t decide on a color scheme, I’m thinking I might need to make one in fall and winter colors, and another one in bright, happy colors for spring and summer. Go ahead and check out the rest of the Four Corners Designs… me, I’m off to select fabric for my jackets! Are you a bit timid about color? 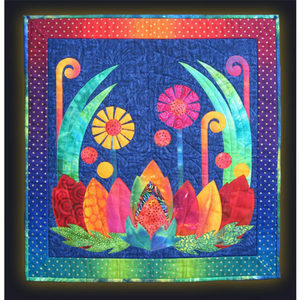 Do you want to explore brighter quilts? Do you want to stretch yourself? A quilt from Kitambaa Designs is the perfect answer. Pippa Moore’s designs are bold, bright, and beautiful. Pippa began quilting in the 1980′s. Her work has been exhibited nationally and internationally. Many of Pippa’s quilts are in private collections throughout North America. 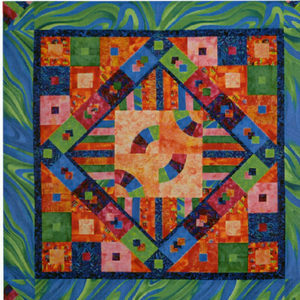 In the last ten years her focus has been on quilts with color and energy, celebrating life. 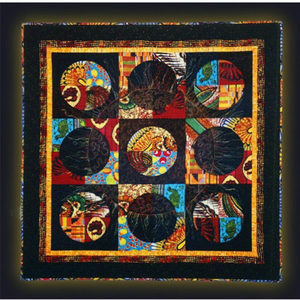 Kitambaa Designs specializes in quilt patterns for African and other vibrant fabrics. Under the African Sun is an adaptation of the traditional Drunkard’s Path block. 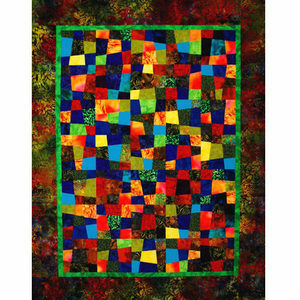 African fabrics, batiks, or bright prints will make this a stunning wall quilt. Pippa’s clearly illustrated instructions make this pattern suitable for all skill levels. 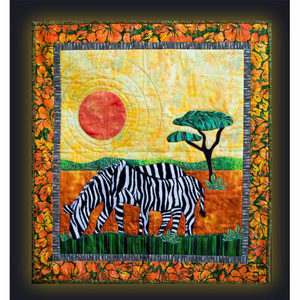 Choose hand applique, machine applique or fusible applique as your method to bring to life Zebras Crossing the plains. Lush green grass is in the foreground and a blazing sun is in the sky. Kitambaa Designs has a series of Art Deco inspired quilts that each vividly portray the feeling of a single word. 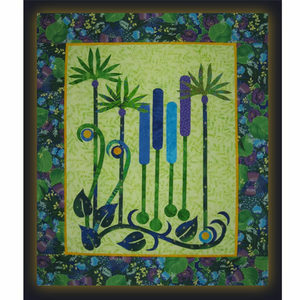 Fusible applique is use for the quilt Felicity. You could also use pastels if that expresses bliss to you. Hope, another in the Art Deco inspired series, is colorful if a bit more monochromatic. To me it looks like, if something other than a floral was used for the border, it would make a nice untraditional Christmas quilt. Go ahead, check out the rest of Pippa’s designs and add some color to your life!